The ubiquity of cloud computing is not new in the present time. It has bought a big shift from the traditional ways businesses think and work. Businesses today want their every task to be done quickly with utmost accuracy and this is exactly the same offered by cloud computing for the businesses related to any industry. Basically, cloud computing is the method of delivering computing services like servers, storage, database, software, analytics, networking etc. over the Internet (the cloud). Cloud business intelligence applications are helping organizations of every size to elevate their business process and decisions to a new level of competency and value. Cloud business intelligence is the product or merger of cloud computing and enterprise resource planning (ERP) which delivers simpler data visualizations, predictive models, multi-source data discovery etc. Cloud business intelligence offers a modular approach packed with robust capabilities which further streamlines all the processes, reduces overall costs and improves customers responsiveness. 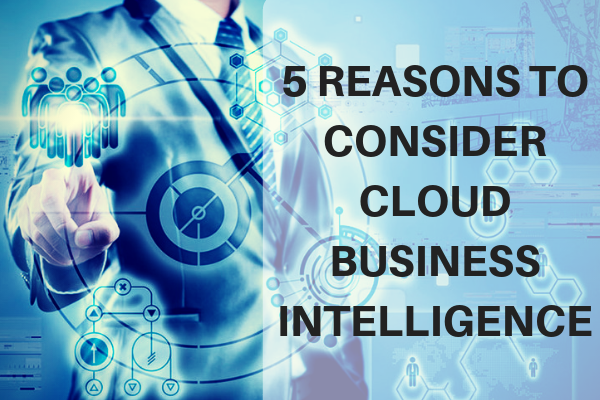 Cloud business intelligence is benefitting the businesses in multiple ways and here are the 5 major benefits of the cloud business intelligence for the companies. Cloud business intelligence uses a mobile enterprise strategy to enable the decision-makers to stay connected to the users 24*7 throughout 365 days in real-time. It has helped the BI professionals to have efficient collaborations and streamlined communications with the clients. It also facilitates the mobile users to access topline reports, act upon critical alerts, project deliverables, customer support, client contracts and much more at any time of the day from the mobile devices, uplifting the productivity to triumphant scale. Cloud business intelligence delivers tactical data security management and ensures that the company data is secured across all the critical phases i.e. data encryption in every phase; whether in flight, on rest or in use. Cloud business intelligence solution offers a range of data security features and protocols like voice recognition and fingerprint authentication protocols to protect the data from any kind of breach.Cloud business intelligence solutions and service providers take the utmost care of the data security and do not rely only on single sign-on security authentication (SSA). It comes with ISO27K standards that assure data integrity and protects valuable data from any unauthorized data manipulation or deletion. Cloud business intelligence solutions include robust data analytics and reporting tools for the businesses to upgrade the sales and marketing activities and increase collaborative campaigns between the sales and marketing teams of the company. These tools help the businesses to result in improved resource allocation, better sales forecast, customer support and enhanced engagement. Not only this, cloud business intelligence also enables the customers to take complete advantage of the regular upgrades and consistent maintenance without spending any extra money. All the aspects of infra, scalability, data refresh capability, redundancy, distribution of the platform and a secure and reliable data layer to perform advanced analytics to the end user are well-taken care off by the SaaS vendors. Organizations leveraging SaaS BI tool remain always equipped with upgraded tools to perform all the tasks efficiently and effectively. Cloud-based business intelligence platforms save plenty of time of the clients with its advanced applications so that the time can be optimally invested in business expansion. Modern day cloud-based business intelligence solutions are so advanced that they offer an in-depth analytics of the data streams. This thorough analytics are further boosted with visual analytics featuring flowcharts, diagrams, charts, decision trees and advanced business intelligence analytics. With all such advancements, cloud business intelligence solutions make data-driven storytelling easier with faster and better insights on sales performance, customer behavior and marketing campaigns. Importance of cloud business intelligence solutions is continuously soaring in the year 2018 (nearly doubling the adoption rate of the year 2016) with the majority of respondents considering it to be a crucial element in their analytics strategy. Dashboards, advanced visualization, ad-hoc query, self-service, and production report and data integration are a few of the most loved features of the cloud business intelligence. To give your business end-to-end visibility across supply chains, Sigma provides enhanced Cloud business intelligence analytics services. The potential of cloud business intelligence is vast and its benefits are already being enjoyed by businesses across the globe with quick and easy deployment, instant data access and reduced costs. The benefits of leveraging cloud-based business intelligence solution cannot be overlooked and the trend of its adoption is expected to grow in 2019 as well.